This is a question I get asked constantly by clients first entering counselling. “I survived” a client once said to me with a big shrug “why does it matter, let’s move on”. The reason therapists are so interested in childhood is because it is where we develop our values and sense of self, in a way as we unravel it we begin to see why we are the way we are. Very few people have a perfect childhood, but if we get the unconditional love and attention we need from our primary care giver we mostly muddle through, knowing we are safe and loved. Sadly many of my clients did not get this safe childhood we all need so much to develop a good sense of self, they were told they would be loved if they behaved or pushed down their feelings. So by examining our childhood with the eyes of an adult we can begin to feel love and compassion for that child who though this was normal. We begin to forgive ourselves for behaviours we learnt to survive our childhood angst and sadness. We may have survived childhood, but now as adults we want to thrive and that means examining our past with honesty and compassion. Many of us are reeling from all the turmoil and horror in the world right now. It may take a bit of imagination but stepping back and focusing on those things we feel grateful for might help us find our balance. I work with a woman who has a chronic illness and felt for a long time that her body had let her down. Slowly over time in therapy she has softened towards her body and been amazed at how much her body does for her daily to keep her in her life. “I always focus on my heart” she said “it works so hard and I often just sit with it’s beating and try to feel enormously grateful”. Gratitude is now being recognised as a real tonic for the mind and body, by focusing on it we can truly learn to be in the moment. Finding three things at the end of a long day to be grateful for connects us to our compassionate self and calms the mind. My list often feels a bit insignificant, such as a great chat with my best friend or an amazing cup of coffee, but it always makes me smile again! The fact that I had to think long and hard before I decided to write about suicide in this blog, makes me fully aware that there is still a huge stigma around suicidal thoughts and ideation. Yet I have had a large number of clients over the years, who have suicidal thoughts and have often felt a huge amount of shame in bringing it to therapy. I have come to understand that those of us who suffer from anxiety and depression can at times want it all to come to an end and stop all the pain. I want to normalise this and encourage people to reach out and speak about how they are feeling, as suicidal thoughts can make us feel isolated and deeply alone. During my training I worked for Maytree, a fantastic organisation that took a normal terraced house, peopled it with volunteers and let those who were feeling suicidal come and stay for a week. The reason it helped was the cups of tea around the kitchen where ordinary people (not therapists), shared how they were feeling and were finally listened to. They helped each other and most importantly they reached out. In her book Stay: A History of Suicide and the Philosophies Against it, Jennifer Hecht argues that we are all precious as human beings and that by asking others for help we give others the chance to help us, as would help them if were in the right place to do so. Most importantly we need to start removing the shame of suicide and begin to talk openly about these thoughts so we can move beyond them. One of the first things I notice about clients who suffer from depression or anxiety is that they often avoid being around other people. For some they find others needs exhausting, for some they feel they might bring people down with their low mood. However as we isolate ourselves we feel more disconnected and ultimately more lonely. Developing a connectivity plan with clients helps them feel they can be of value and be around others. It might entail just being in a cafe for a coffee, sitting and simply being with others, smiling and making conversation with the waitress. The more you do it the more normal it will become. Try to find a way to be connected every day, either by volunteering, chatting to a new person at the bus stop or by joining a new meet up group. Everyone has the potential to impact positively on someone else’s life, we just need to take the initiative. Just notice how connecting makes you feel and how it can lift your mood. Dec 2018: Do you need to be in crisis to come in to therapy? Over the years one of the questions I often get asked is does it need to be a crisis before you ask for help and enter therapy. The answer really lies with the individual client, most people know that they have managed as much as they can alone and need someone to work with to help them find the next steps on their journey. I have had clients who have been approaching great life changes and want someone outside of their immediate circle of family and friends to discuss where they were in their lives and their hopes and dreams for their future. Others have wanted to talk about their own development and what they feel they need to do to make some vital changes to help them reach their full potential. One of my previous clients wanted to set up her own business and felt restricted by the responses she had from others. ” I knew that my instincts were right, but I didn’t have anywhere to go to discuss options, therapy provided me with a non judgemental place to do that”. So as we enter a new year and look forward to a brighter future, why not consider a term of therapy it could make all the difference. A past client once said the me that bereavement was like being on a rollercoaster, you never knew what was coming next. Anxiety is not necessarily a feeling we might associate with grief but for many coming in to counselling, it seems a very common feeling and can be enormously debilitating. Anxiety is often recognised as a feeling that the world is not a safe place. When you loose someone close to you, you have proof of this and it can change the way you view some fundamental things. Clients report having to always have phones on and fear greatly being out of contact in case it happens again. They might worry endlessly about those they love, fearing something may happen to them and they will also loose them. Grief can turn you inside out and if you also feel anxiety on top of this you may begin to withdraw from the world and stop trusting others. In counselling we gently begin to work with unresolved feelings around bereavement, share how this has impacted you and maybe changed your view of the world. Slowly over time and with much self compassion, we begin to trust ourselves again and be able to turn back to life. Sept 2018: Is your anxiety holding you back from travelling? Travelling and holidays are mostly seen as great ways to relax and recuperate, but as Summer comes to an end, I have clients who found it all incredibly stressful and very triggering for their anxiety. Yet I am a firm believer that challenging yourself with travel is as vital for those with anxiety as everyone else, perhaps even more so. As I sat on a train station in Croatia, with a broken train and the prospect of a long bus journey ahead, I felt my anxiety rising. I hate buses, feel travel sick and frankly cope badly with changed plans. I felt my temper rising and my inner critic raging that I should have flown rather than taken the train. With a bit of self coaching to “remain curious”, I got on the bus and actually arrived early in Zagreb having made a friend and seen a new landscape! Anxiety should never get in the way of having an amazing experience. Making yourself feel safe and planning is great, but learning to handle change and problems, builds resilience and can make you feel incredibly proud of yourself as you overcome them. Rare is the person who has truly triumphed over self doubt, anxiety and lives a life free of internal wrangling. For many people the inner critic feels so much part of them that they defer to it almost continually. A past client used to say it was easier to give in and agree than fight what the inner critic was telling him, even though he knew it fed his anxiety. So how do we work with this powerful driver and make it work for us? The first thing we do is name it during counselling, give it a name and make it present. This allows the client to say “oh there goes my life is unfair voice!”, lets see what it has to say today. By working with a therapist to being to understand where the voice comes from and who it may represent (controlling Mother anyone! ), gives us a chance to explore what the purpose of the voice is and why it is there. For many of us, we developed it in childhood to keep us safe, or to keep us going during hard and challenging times. Looking at the voice with compassion an understanding, helps us be able to manage it and even see within it, the qualities we can take in to our every day life. One client said she knew the voice had helped her overcome an abusive marriage, but now she no longer needed the voice to keep her safe, so it was time to adapt the voice to her new life. June 2018: Do something to make your heart sing! I have always been fascinated by the heart; the seat of feeling in the body and a place we consistently ignore in favour of the head. By learning to listen to our heart we may learn some very interesting things about ourselves and start to see where we might need to focus some of our energies to help us in our lives. You might like to try my heart focused mediation. Spend some time breathing and focusing all your attention on your chest area. Listen to the rise and fall of your breath and the gentle, regular beat of your heart. Focusing all your attention on the heart, try to tune in to your heart. Take it slow, the heart is quiet and the chatter of the mind often drowns it out. Listen carefully to what your heart is telling you and be open to the gentleness and softness it can bring. An even easier way to connect to your heart is to ask yourself what you need right now, what would make my heart sing. Then do it. Maybe a bike ride in the wind, a hot chocolate, great chat with a friend or a gorgeous bath. Tune in to what you need and do it, the heart really needs to sing once in a while! We all use the word boundaries a lot, without really thinking of its implications and what it truly means. Brené Brown says that boundaries are simply “What is ok for you and what isn’t”. This appeals to me because it helps me analyse what boundaries I need in my life and which I need to really express. Because, as we all know, it’s when we need to express what isn’t ok for us to others, that is often becomes a real challenge! In therapy we often work with this issue, to help clients find out what they need to make things ok for them and express what they need. I often practice on the small things, I ask myself how this is making me feel? Often I feel a bit of anxiety or nervous in my stomach and this tells me that something may be testing my boundaries! So then I ask myself what do I need to make it ok, it often comes up that I need to let someone else know what boundaries I have. An example is, I have a dear friend who is consistently late for our meetings, they are informal and supposed to be fun so I felt awkward saying anything. I try not to be late and for me it is a boundary I put in place, as I feel it is disrespectful to others to waste their time. This is my boundary and I know others may not agree, but it feels an important value to me. So I spoke up kindly and with compassion saying this is what I felt. It wasn’t a boundary she shared, but she understood and we agreed to try hard to be on time. It took courage to do this, putting in place boundaries can be scary but to be truly ourselves we need to show others, with love and compassion, what is ok for us and what isn’t. 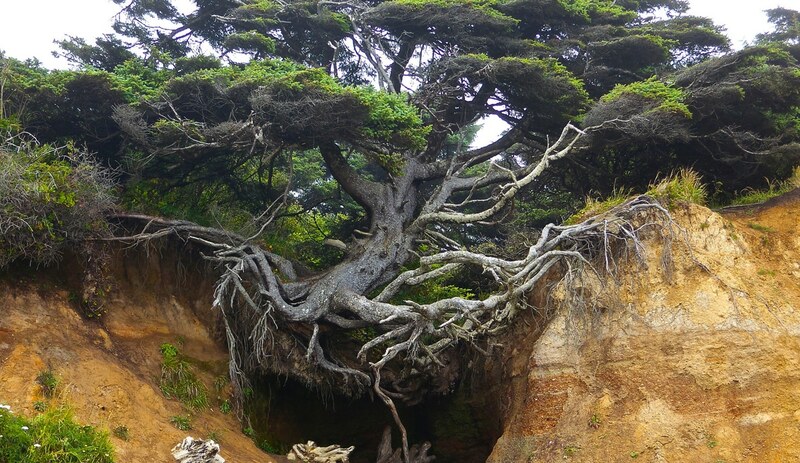 This image really struck me as the tree seems to be thriving, despite its very precarious home! Some people also seem to be able to bounce back from difficult situations with no trouble at all, for most of us though, its much more challenging. Building resilience is a big theme in psychotherapy, we work with clients who may have have suffered difficult and challenging events in life. As a result they may have lost the ability to cope and ultimately their trust in the world and others. Their ‘Inner Critical’ voice may be unduly harsh, undermining self confidence and making them withdraw. So how do we develop our resilience and restore our ability to cope? It is a slow and very gentle process, we notice the language we use with ourselves, softening our attitudes and giving ourselves a break. We listen to our needs and act on what makes us feel good, slowly we can emerge from this dark place. In a way building resilience is not about building strength, is it about building flexibility and acceptance. Instead of saying to ourselves, “Its time to pull yourself together”, its about saying “You have been in tough places before and it has passed, the time will come again, let’s hang on in there!”. Resilience is about knowing your qualities and strengths and calling on them and being in counselling can help, as your therapist can remind you of them. Posted March 2018: Why Hope helps. I was really drawn to this simple image of a stone with Hope on it, it feels like you could just pick it up and hold on to it, like a talisman. If only hope was really so easy to find, many clients have lost their ability to hope and feel mired in sadness and loss. In therapy we often hold the hope for our clients, my old supervisor used to say it was like holding a candle in the dark. When our clients are ready we hand the candle back to them, which is an image I love to think about. Entering therapy is a very hopeful thing to do, it means we believe we don’t have to suffer and could live another way. So look for hope in small ways, the kindness of a stranger, a great chat with a friend, hug from your child, it is there if we look but we need to tune in to see it. I hope you find some hope this month, with every passing day Spring is on its way, here’s hoping! Posted February 2018; Why Nature is the best Therapy! I often get asked what clients can do when things become overwhelming and I always say, go outside, find a tree you love and lean against it. It really works, give it a try! Human beings are naturally drawn to nature and the colour green is calming, but for me its secrets lie in how it changes every day, embracing the day whatever the weather and season, it is a great reminder that change is constant and resisting it saps our energies. When I need a boost I walk mindfully, feeling each step on the path and fully grounding myself. Slowly my circling thoughts ease and I focus on the clouds and feel of the wind. As the first buds of Spring appear I feel true hope returning, I hope you do too! One of my clients recently asked me why my practice was called Grow Your Potential. I explained to her that potential is really fundamental to the drive behind our work together in therapy. As a Transpersonal Psychotherapist, I am specifically looking for the qualities that make my clients unique that so often go unrecognised and unnoticed. Even when things in our lives our truly awful and we loose sight of ourselves, it is often these qualities that give us resilience and strength to overcome them. It is our role as therapists to mirror these qualities and help our clients see themselves more clearly. When we begin to see our complexities, we can be kinder and more compassionate to ourselves, even begin to love who we are. In therapy we often hold the qualities of our clients close, my old supervisor used to say it was like holding a candle in the dark. When our clients are ready we hand the light to them, which is an image I love to think about. As we enter the new year, I like to believe we could all see some of our great qualities if we could stop judging ourselves. This is why my resolution this year is to be kinder to myself and to watch how I speak to myself.